We thought we were done with winter. The mounds of snow and ice from a series of snowstorms in December had finally melted away when winter returned. It’s been an exceptional season in these parts. We’re usually lucky to get away with one or two snowfalls through the season. And they’re quickly washed away by relentless rain. But this year the cold and snow have stuck around. That’s made it tough for people to get around, navigating sidewalks that haven’t been shovelled, searching for parking in lots shrunken by sky-high piles of ploughed snow and ice. It’s also created challenges for real estate. Photos of new listings can date pretty quickly when they’re shot through snowdrifts. 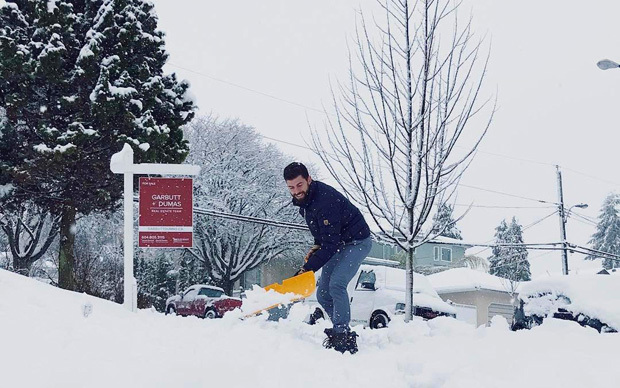 We’ve got to remember to pack shovels to clear walkways when we’re hosting open houses. Shovelling a path through the snow to an open house is all in a realtor’s day’s work this winter. On the upside, sleds that were purchased years ago are finally out of storage, we’ve actually been able to skate on outdoor, natural ice (for a few days at least), the skiing has been fabulous and our familiar surroundings have taken on a whole new beauty. So cozy up to the fireplace, snuggle into your favourite blanket and enjoy this stroll through our latest blast of winter. We’ve endured the cold so you don’t have to!